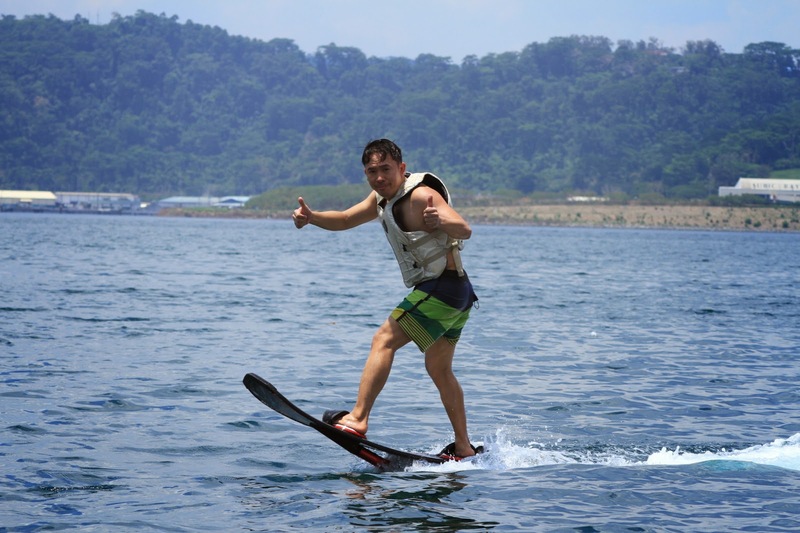 Two months ago I went to Subic to try the new extreme sports called hoverboard, but the unavailability of some parts stymied my plans. I ended up jetskiing that weekend. This weekend I and Arvy went to Subic again to give it another go. After inventing the flyboard in 2011 (which I also tried), Zapata Racing, owned by the French jeyskiing champion Frank Zapata, came up with another machine designed to thrill - the hoverboard. He got the idea from Marty MacFly's machine in Back to the Future, but his was designed to be operated in bodies of water, not in the streets of Hill Valley. Doing ZR's hoverboard is actually a cross between surfing and flyboarding. 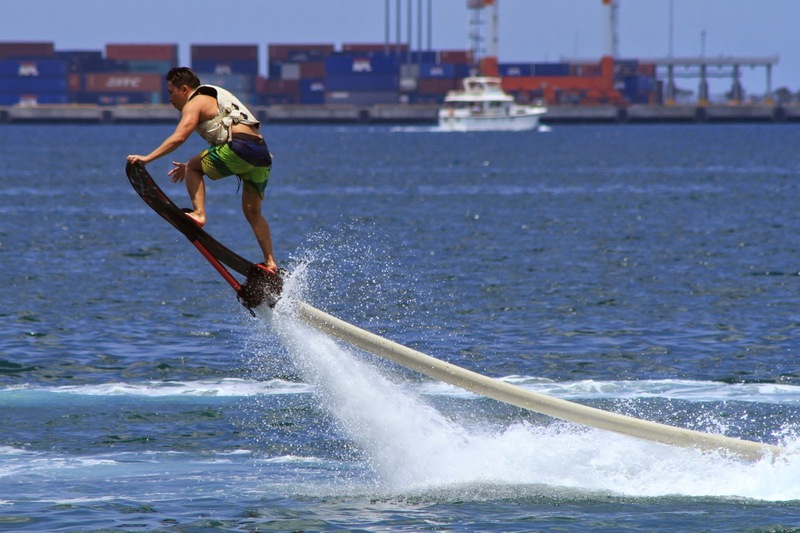 Unlike the contraption in flyboarding that's attached to your feet, you ride in a small board, about the size used in wakeboarding. It is attached to a jetski via an 18-meter kevlar hose. 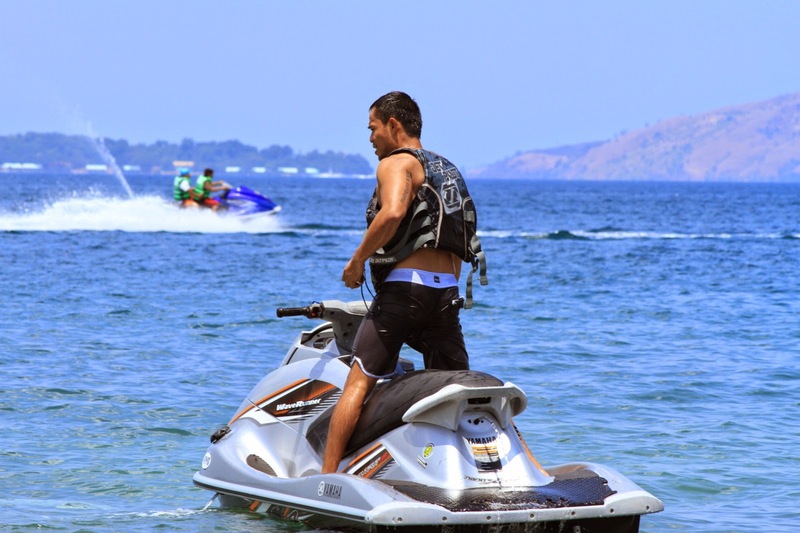 The jetski supplies a continuous jet of water that is expelled through a nozzle located at the end of the board. The jet of water is enough to support your weight and propel you forward (or upward, which can reach up to 5 meters high). You control the board by balancing, as you do in surfing, and you can tilt it side by side for directional control. You can control the pitch, by changing the angle of the board and pointing it up or down. "This is how you do it"
After breakfast (we stayed overnight this time) we went to Networx Jetsports to sign up for the ride, which they only recently offered. I was given some introduction by Vince, who's the manager of the facility. He gave me some safety and riding tips, as this was a bit different from all the other water sports I've tried so far. My plan again was nearly scuttled by an errant part - the locking mechanism of the kevlar hose won't attach securely to the jetski. After some tinkering and pounding with rocks and hammer, Vince and co. got the lock in place. I was also told that the jetski we used has about 250 horsepower, more than enough to support my weight and propel me forward. Vince is the one who's going to operate the jetski but he did a couple of spins in the hoverboard so I can see how's it's done, and also to test if the locking mechanism is holding up. My excitement was building up at this time. He came back then signaled to me to get in the starting position. The initial position for hoverboard is actually similar to a wakeboarding or waterskiing - the board is under you , with one foot on the back harness while you're submerged in the water up to neck deep - but without the rope. 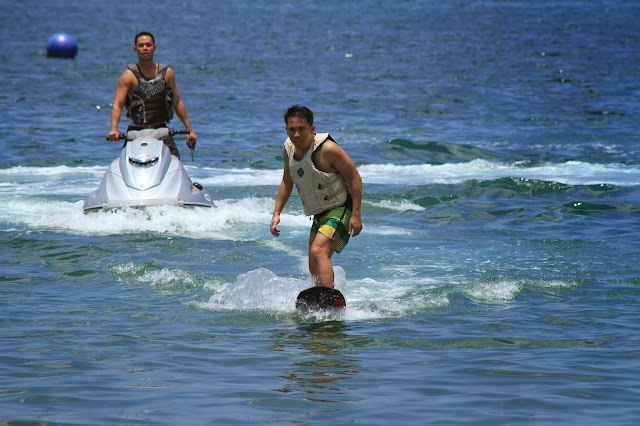 The jetski will then throttle and you'd feel the rush of water coming out of the board, pushing it forward. You ride it for a bit until you gain momentum - from which you can position your other foot to the harness. Of course I didn't get it right the first time. Before I could fully ride the board I fell to the side and into the water. I tried again, and I was able to balance this time, and I was able to ride the board, like in surfing. 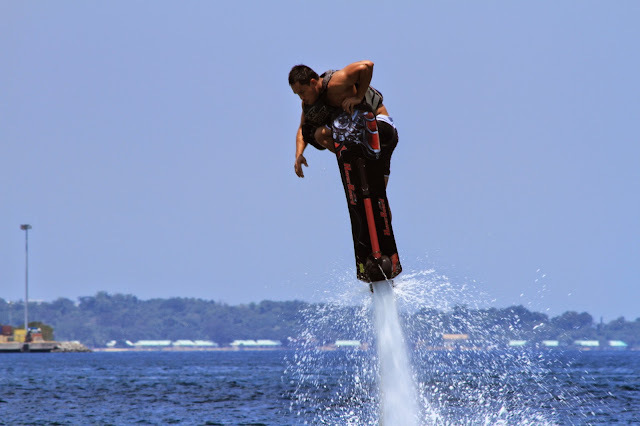 I thought that if flyboarding is like Tony Stark with his repulsors, riding the hoverboard is like Silver Surfer skimming along with his board. I was skimming the water as the board was gaining speed, but I was tentative at first in moving the board from side to side or up and down. I did eventually, as I have to turn the board around and circle back around the jetski. Gaining confidence now I started doing some turns, and I turned the nose of the board up - pushing me upward until I was almost vertical with the board - about 10 feet up. At this point gravity showed me who's the boss, and I plummeted back and hit the water hard.I was able to push the board away so it did not fell on me. I bobbed up the water and gave a thumbs up to Vince, saying I'm OK. I got back in position and started again, taking longer rides this time. Arvy is also now on a jetski, taking photos (thanks!). I think the time I spent surfing helped, as it did not take too long for me to balance the board, and to have that directional control. I wasn't able to master fully the situations where the board gets vertical. Supposedly you will have to lean on it or flip the board to go back down. I just ended being thrown into the water, and it happened about three times during the 30 minutes that I was there. I got a couple of bruises and scrapes on my arms as souvenir, though not banged up to get a concussion. I lost my left contact lens. Update: I woke up with a black eye today. When the half hour was nearly over I took one last ride which I think was almost flawless (in my standards as a beginner), with no spills or falls. Before wrapping up Vince let me try the flyboard for another 5 minutes, which was cool. Overall I think that riding the hoverboard is more exciting than wakeboarding, or even flyboarding. 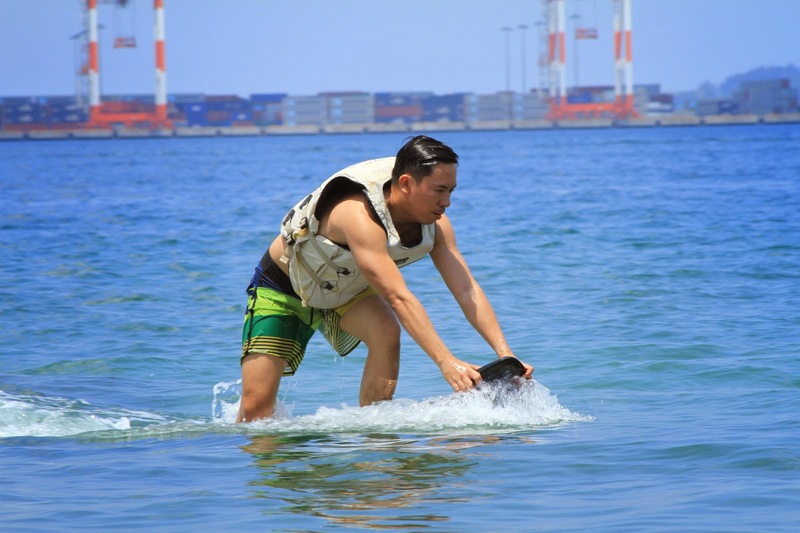 I can't compare it fully to my experience in surfing, as I haven't surfed the way professional surfers do, like doing tricks or surfing in really large waves. Definitely I'd like to do again in the future (and hope to master it). Note to self: do not skip leg day at the gym. The session lasted around 20 minutes, and it felt like I was surfing on a very steady wave, and that I was riding the board for that long. I enjoyed this more than the last, and I think I'd be doing this again. Riding the hoverboard costs the same as flyboarding - PhP4500 for 20 minutes, although I got a 15% discount voucher from Court Meridien hotel, where we stayed (it is right across Networx). 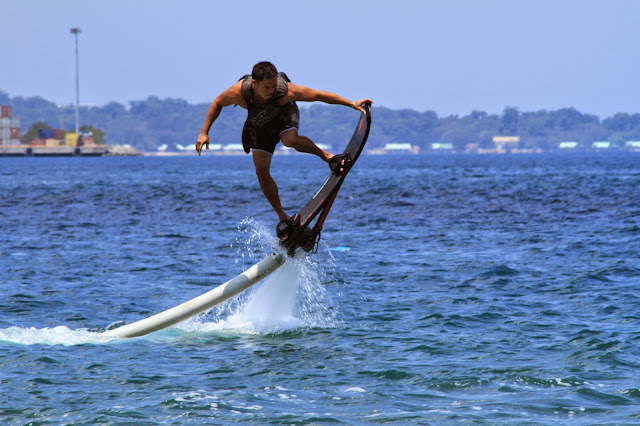 They have other rides and water sports equipment for rent, such as banana boats, parasailing, yachts, and of course, flyboards. Website: www.networxjetsports.com. Big thanks to Arvy for taking the photos, and to Vince for the assistance. Disclosure: I have no material relationship with Networx Jetsports. I did get discounts for being a repeat customer.